When unexpected delays in production represent a significant loss of revenue, the reliability of systems integral to production becomes a necessity. Production at the New Center Stamping plant is dependent on reliable levels of compressed air. A 25% reduction in available air pressure causes the air - dependent machinery to automatically shut down. If the air supply cannot be restored, production ceases and workers are sent home until the system is fixed. The existing compressed air system was a collection of equipment from various decades. Some of the equipment dated as far back as the early 1900’s when the building was constructed. One piece of equipment, still in use far beyond its expected lifespan, had been manufactured by a company long ago out of business. When a critical unit broke down, and purchasing a replacement unit would cost more than $150,000, a system - wide upgrade was discussed. The disjointed and outdated present system had become a financial nightmare. The Energy Alliance Group of Michigan (EAG) was tasked with developing a comprehensive plan. EAG teamed up with Air Technologies to provide a unique solution known as DirectAIR®. The solution would include a variety of benefits beyond the key benefit of reliable production. After an extensive “air audit,” the quantity of air needed for full production was calculated. Based on that number, a customized, self contained compressed air “plant” was created, delivered and installed adjacent to the facility. 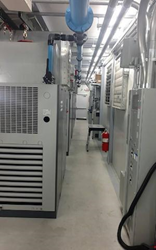 Once electrical power, a heat exchanger and air delivery lines were connected to the “plant,” a completely upgraded, high tech source of compressed air was online and fully operational! The previous “system” would no longer stop production! ● Air consumption computer controlled - less waste and a significant reduction in electricity used due to computer analysis of the exact amount of needed air. ● Zero down time - all maintenance and repairs are included with the service and the equipment is constantly monitored offsite. Automated alerts give technicians spontaneous information so they show up for service before the production team is aware of a potential problem. ● Redundancy - included backup systems guarantee zero downtime. The DirectAIR® solution was installed without any capital outlay - the plant only pays for the amount of compressed air actually used. And, coupled with other upgrades, it resulted in a significant utility rebate and qualified for financing from Michigan Saves. The company expects to reduce maintenance costs, lower their energy bill and reduce production downtime by at least 1000 minutes per year - just on one of their production lines. 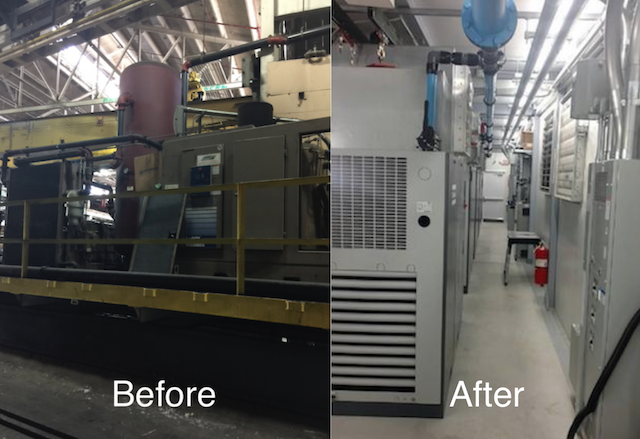 When production is as dependent on reliable compressed air as most companies depend on reliable electricity, it’s easy to understand why affordable upgrades to outdated equipment is not an option but a revenue protecting necessity. About The Energy Alliance Group of Michigan: The Energy Alliance Group of Michigan, a division of The Energy Alliance Group of North America, is an energy solutions and cost recovery company providing energy-saving products, technologies and services for commercial, industrial, multi-family, non-profit buildings, and agricultural applications.